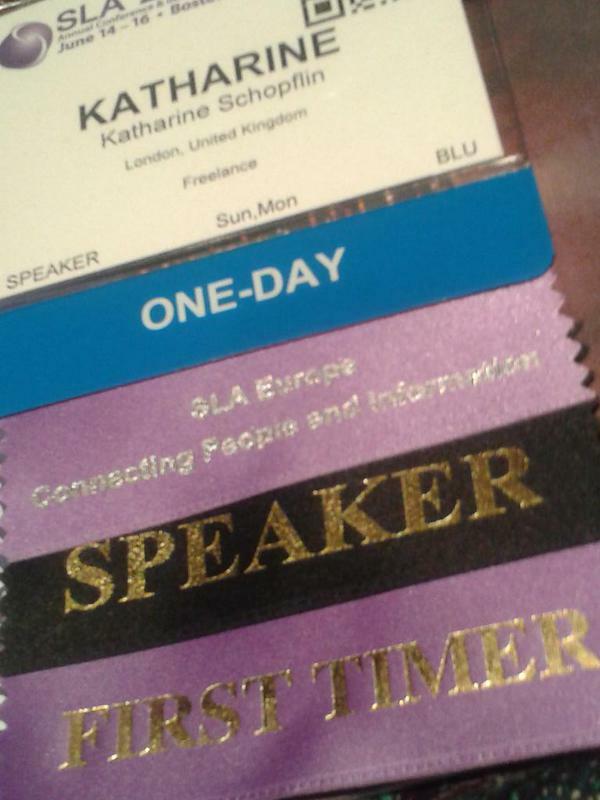 When I started out in the information profession, such things as Early Careers Awards to attend the SLA conference did not exist (all the more reason why, if you’re in your first five years, you should definitely apply). So it was nearly twenty years into my professional career that I finally went, having had a contributed paper accepted on a third attempt (in ten years), this summer at Boston. Although I’m a veteran conference attender, this was my first outside of Europe and I took advantage of the pre-conference guidance offered by the ever-helpful Conference Advisory Council Chair Tracy Maleeff. Nuggets of advice like: take lots of business cards; wear comfortable shoes and bring layers; spend lots of time looking at the schedule and planning; were invaluable in helping me prepare for a conference of a size and scale I hadn’t previously experienced. And although I couldn’t attend all three days (speakers only get the day they are speaking on for free – I paid for the Sunday in addition) the conference was a great experience for me, and highly recommended for even the most jaded information professional. Of the formal sessions I attended, the most valuable was ‘Everything you wanted to know about negotiating with Vendors’. After spending most of the last decade in knowledge management, I’ve recently moved into a subscriptions and licensing role. Sitting in a room not only with vendor and author Michael Gruenberg, but many library professionals experienced in buying information products, was a powerful experience. Michael talked frankly from the sales perspective and the level of discussion was honest, sophisticated and highly revealing. I liked it so much, I bought the book. As a contributed paper giver, I am biased towards these sessions, which showcase new research in the profession. I attended the Sunday session as well as my own on Monday and I was impressed by the range and level of topics covered. I quite possibly would not have signed up for a session on the basis of the subject matter of any single one of the talks, but I learned a huge amount from the speakers I heard. Notably, Lian Ruan’s insight into managing learning and knowledge transfer in a Fire Service gave an interesting slant on the challenges faced by different employee populations. And John Buzzanga’s talk about developments in search technology was refreshing and informative. These sessions appear a little anonymous in the programme, which is a shame as they seemed like the source of some of the most original learning at the conference. The social events weren’t perhaps as wild as I’d been expecting but it’s entirely possible that the real party happened after I went to bed (that’s what happens when you’re my age). Still, I enjoyed the Monday night experience of travelling from reception to reception to say hello to different groups (and then returning to the New England one as that had the free bar). And the IT Dance Party was everything I’d been led to expect. My only disappointment was that the SLA News Division seems to have virtually disappeared. Its planned event was cancelled and I couldn’t make contact with anyone via its Twitter account. Years ago, when media librarianship was still going strong in the UK, I first joined SLA at the London Online Exhibition. When I chose my division the people on the stall said ‘Party Group!’. I’m one of a tiny number of information professionals working in the media in the UK today and saw the demise of the Association of UK Media Librarians, an organisation I once chaired. I’d be sad if our US big sister has gone the same way. That aside, I can thoroughly recommend the SLA experience. Having covered most of my costs myself, I can honestly say it was worthwhile. And for an early career professional, it could be a life-changing experience.